I don’t know when exactly is happened, but as I was getting my daughter ready for the day very early in the morning last week, I had to spend 10 minutes looking for a matching outfit. In my opinion that is just to long to be looking for something that early in the morning. I knew it was time to do something about the clutter and make both of our lives easier. So I spent some time this weekend cleaning and organizing her wardrobe and now things are much easier to find any time! 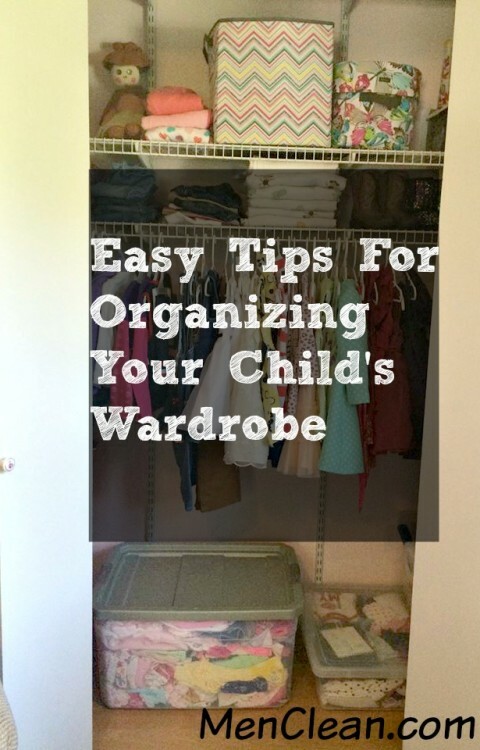 I thought this was something lots of parents could benefit from so I wanted to share these easy tips for organizing your child’s wardrobe, let’s check them out! 1. Out with the old! One thing I was guilty of was keeping clothes around that my daughter either couldn’t fit in to anymore, or that she simply wouldn’t wear. So I went by the same rule that I go by with my own closet, if she hasn’t worn it in 6 months, out it goes! 2. Get your kids involved! Now this tip of course is dependent on your children’s age, but if they are old enough to dress themselves, they are old enough to get their own clothes. I’m a firm believer in having my daughter do things for herself (she is 7) rather than me doing them for her. If they see what goes into cleaning up a closet, they are more likely to keep it clean and organized. It make take a little longer, but it’s important to let them help! 3. Use the color system! Something that works really well in our home is organizing clothes based on what color hanger they are on. Pink hangers=dresses, white hangers=shirts, blue hangers=pants, etc. Now she knows when putting her clothes away where to put them, and what color hanger to look for when choosing her outfit for the day. 4. Make a list! When it’s time to buy new clothes, make a list of what they actually need, versus heading to the store and buying whatever jumps out at you. Not only will it save you money on clothes, it will save you room in their closet and drawers. 5. Invest in a shoe rack! I’m telling you, an over the door shoe organizer is a must have. One thing I hate is tripping over shoes on the floor, and how messy it makes a room look. A shoe organizer will also ensure your children know where their shoes are in the morning! 6. Roll, don’t fold! We all know how precious drawer space is. Instead of folding clothes, roll them. You will have SO much more space, I promise! Bonus, the kids can do that themselves! There you have it! 6 easy steps to help you organize your child’s closet! Do you have any tips to share? Leave them below!